An established Philadelphia institution for over two decades, La Colombe Coffee needed help launching their brand nationally. Our design team had the pleasure of re-envisioning their digital brand and ecommerce experience for the big move. There was already an existing ecommerce experience La Colombe had outgrown. We began our efforts looking at their existing analytics and user flows to inform our IA efforts. The UX team diverged to work on the UX while the designers began developing an updated digital style guide and UI component library. In talks with the stakeholder team, they were committed to a continuous stream of updated high end photography, so we let that take center stage with the new site design. Once we had approval on the homepage visual approach, design converged back with UX to build out the full UI component library. In a parallel effort to the completion of the component library, we received approval on wireframes and content hierarchies for the remainder of the site. 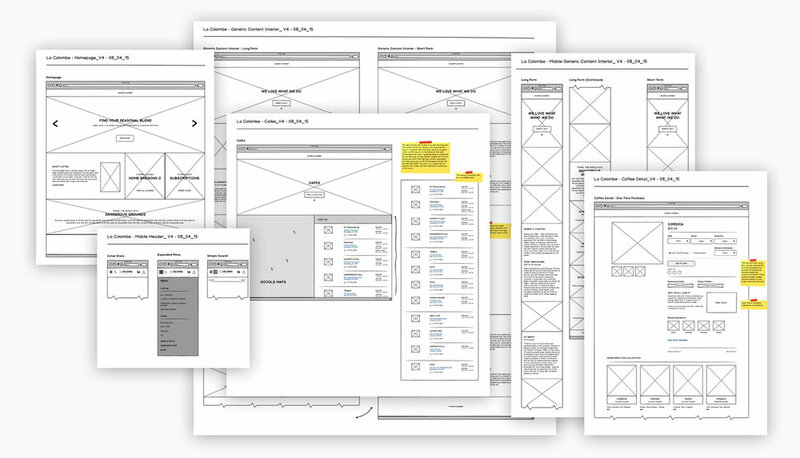 Utilizing both the UI component library and detailed wireframes, developers were able to the overlap UX and design efforts with their own. Many of the screens were quickly prototyped and took shape in the browser as we got closer to launch. We collaborated with La Colombe to roll out product specific landing screens as well. The landing for their canned Draft Latte product had particularly high user engagement. La Colombe had an awesome stakeholder team – We worked with them on an ongoing basis. We enjoyed collaborating on future thinking projects including a store app and a Watson AI powered digital barista concept. Collaborating with the La Colombe stakeholders on strategy and design was always a lot of fun. The great work is a testament to the relationships we were able to foster through our various project engagements.